The nicho retablo I created for my Day of the Dead/Dia de los Muertos altar this year! This summer I visited the National Hispanic Cultural Center in Albuquerque, New Mexico. I always love going here and seeing the exhibits. My late cousin, Chila (Orcilia Forbes), served on the board of the center and it’s such a wonderful place to visit and explore. I was walking through the permanent exhibit section with my mother and my cousin, Ophelia (better known as Boogie! ), when we came across a really beautiful piece of artwork of the Virgen de Guadalupe. It was a retablo or shadow box of a large Virgen Mary in the center, surrounded by small shadow boxes all decorated in different ways with other images of Mary. We were all in awe of this piece. I wish I could remember the name of the artist, but suffice it to say that the wheels started turning in my head and in my cousin Boogie’s head! I didn’t get a photo since no photos were allowed in the gallery, but I sketched out the design so we could have something to reference. Boogie and I decided this was something we needed to modify and try for our next Zuniga Family Reunion in 2019! We always bring photos and make a point to remember family members who have passed on. This would be a wonderful way to engage family members and plan a reunion activity! Between now and then though, we decided we would each work on a prototype to see what we needed to have on hand in order to create a nicho retablo. My cousin Boogie lights the candles with the help of one of the “little” cousins. Photo with my cousin Boogie – she made the Day of the Dead mug for me! As background, nicho retablos are a mixed media type of creation or artwork. In Hispanic culture, they tend to be spiritual and religious and can be used on an altar for events such as Dia de los Muertos or in devotional places of your home. Sometimes these are made with small tin boxes, like an Altoids tin box, while others are made with wood and have doors that can be closed on the images inside. These are always very colorful and vibrant. The décor can be quite ornate but there is a beauty in all this décor and it is quite striking because it tends to signify the person or persons being honored. Boogie called me shortly after I got home from Albuquerque and she had found some shadow boxes at Hobby Lobby that she thought would work well. She sent me a photo and I went to buy a few. They looked perfect! 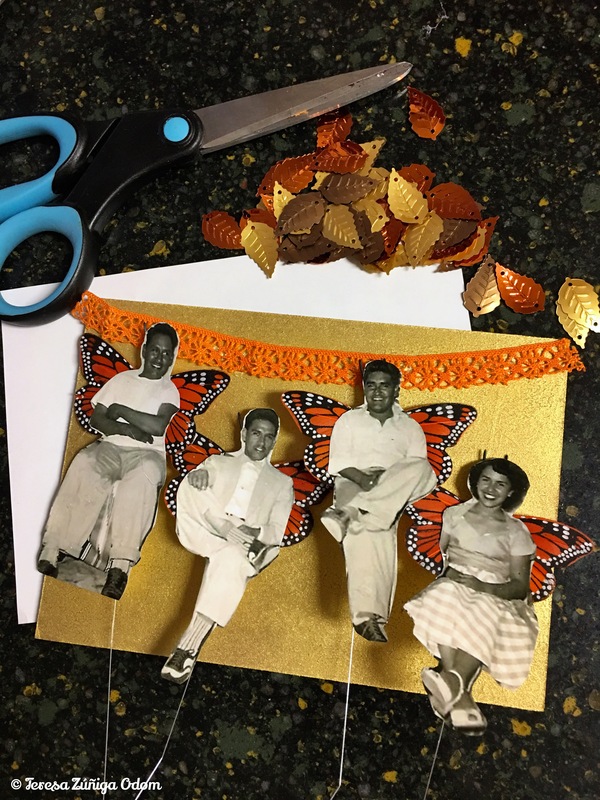 I set out to make a nicho retablo for my Day of the Dead altar this year and chose a photo of my father with his two brothers and sister. 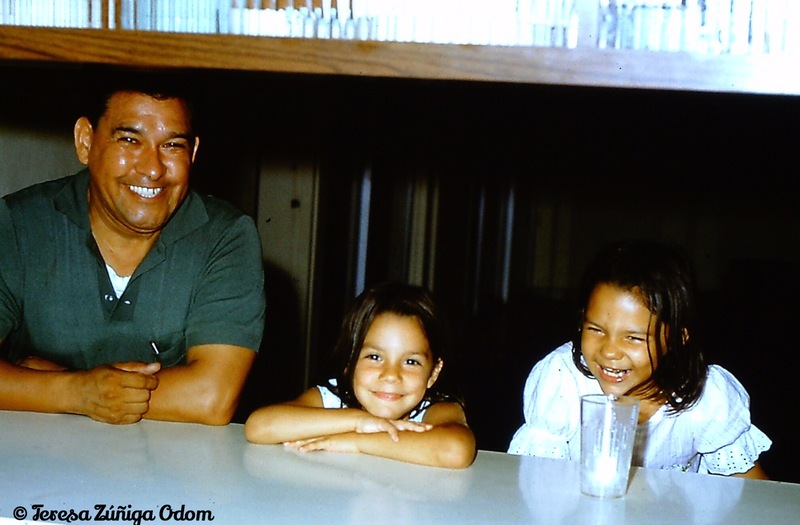 I’ve always loved this picture of them…all sitting on the couch at my grandmother’s house and smiling broadly! I knew I wanted to make this multi-dimensional so I made several copies of the photo so I could cut out each figure and experiment. My Uncle Lorenzo wearing monarch butterfly wings! Almost finished applying the wings…just have Aunt Gloria to go! Meanwhile, I had collected various “artsy” items like old jewelry, fabric leaves, decorative ribbon and other crafty items from various places. I hit a creative roadblock as I got started and I wasn’t sure what to use so I went to Pinterest to browse. 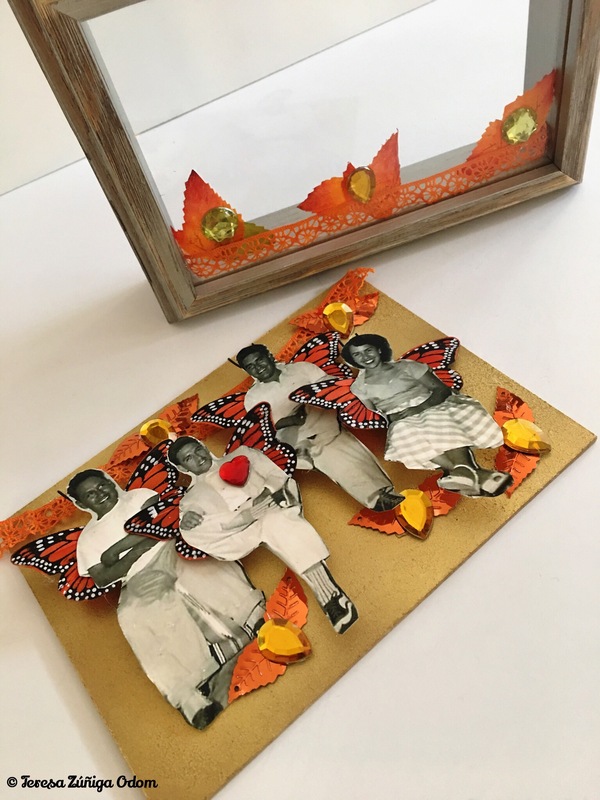 Something I saw sparked my creativity and I decided I needed monarch butterflies to place behind each figure from the photograph to make it appear they had wings! I headed to Michael’s and found a package in the perfect size! From there everything started evolving…I used ribbon at the top of the display that reminded me of papel picado. I also placed some of the same ribbon on the glass at the bottom. Next, I hot glued each of the figures to the back of the shadow box, staggering them so they would all fit. Hot glue applied to the orange ribbon. Separated plastic gemstones to use in the retablo. Finished sequins and gemstones – they look like flying hearts! Next I used plastic amber gemstones from an assorted I bought at Hobby Lobby along with brown sequins leaves – two leaves to a gemstone – to create a flying effect, like a flying heart. Honestly, I wasn’t sure how I was going to use them but when I put them on the counter top, two leaves fell next to a gemstone and I took it as a sign to use that particular design! The front part of the retablo, the glass, needed a little something more so I cut up a few fabric leaves to make them smaller and added a yellow looking plastic stone – again, keeping with the flying heart effect. Heart applied to my dad’s photo and a look at the glass decor before everything is finally pulled together and completed. The final touch was a red plastic gemstone heart. There was only one in the package that I bought. 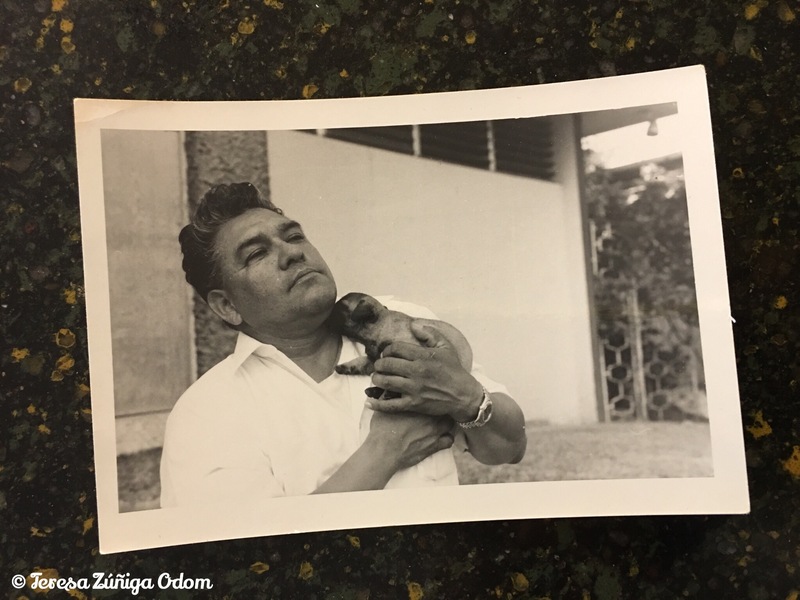 I placed it on the photo of my father adding a pop of color to the shadow box. It was now ready to seal up and place on my dining room altar. The addition of this handmade nicho retablo this year is really what my altar was missing and feel a few more in the works in the weeks to come. I know when I begin seeing photos on social media of other altars for Day of the Dead/Dia de los Muertos this year, it will keep this creative streak alive so I’ll need to take advantage of that! 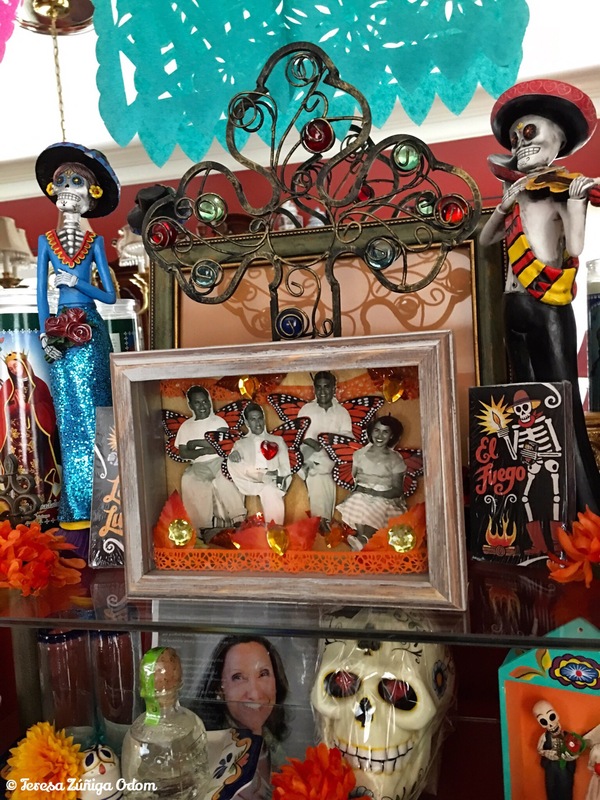 My newly created nicho retablo now has a special place on my Day of the Dead/Dia de los Muertos altar! 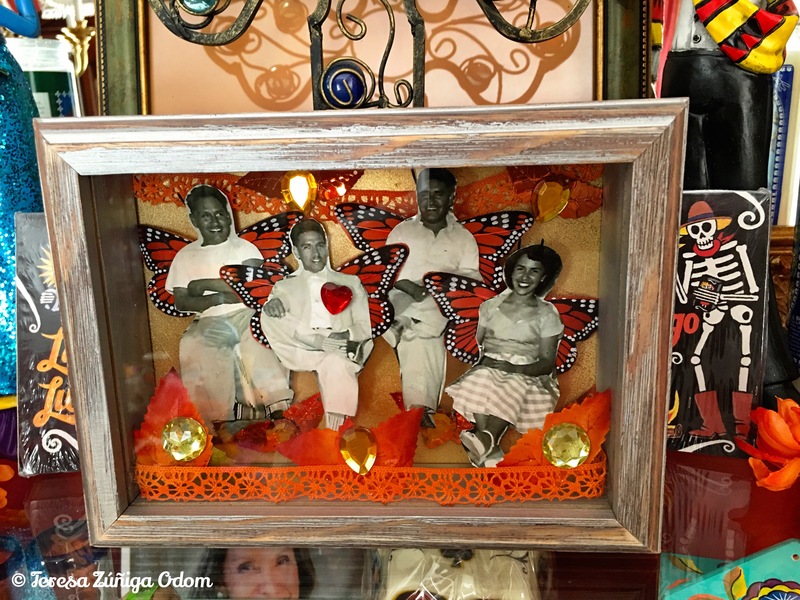 This entry was posted in Day of the Dead, Dia de los Muertos, DIY, Mexican Art, Zuniga Family and tagged arts and crafts, day of the dead altar, Hobby Lobby, Michaels, Monarch Butterflies, National Hispanic Cultural Center, New Mexico, nicho retablo, Ophelia Zuniga, Papel Picado, Pinterest, shadow box, Virgen de Guadalupe on October 30, 2017 by Southern Señora. Fiesta 2017 – A Celebration of Generations! 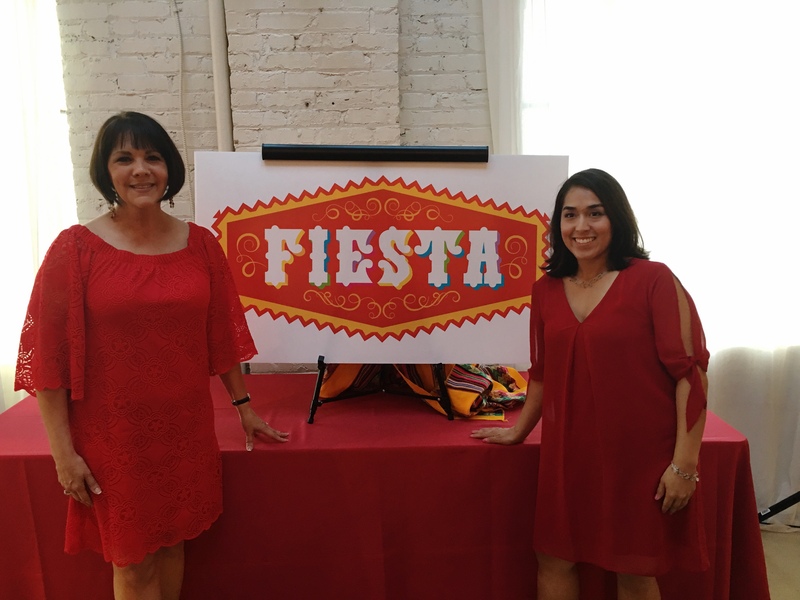 Fiesta Co-Presidents, Teresa Zuniga Odom and Vanessa Vargas pose with the newly unveiled Fiesta 15th Anniversary – Quince – logo! A Celebration of Generations…that’s what Fiesta 2017, the Quinceañera, was billed as and it definitely delivered! 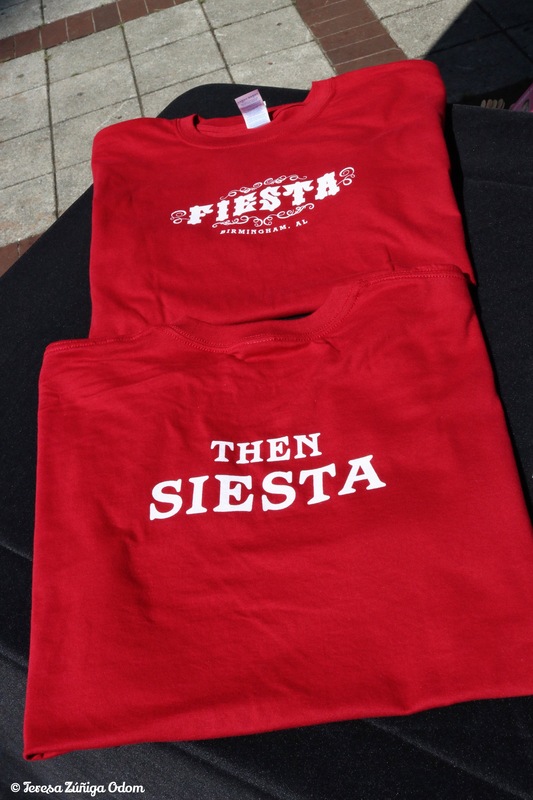 Our Fiesta t-shirts this year – Fiesta…then Siesta! 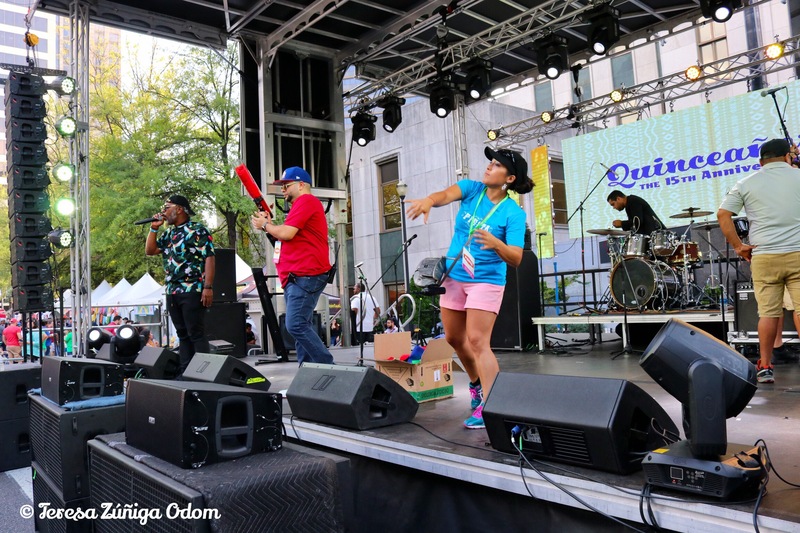 Looking back on Fiesta 2017 and our path to Quince…I have to say…it was our best festival to date! Every quadrant of Linn Park was filled and we had well over 100 tents in the park – a record for us. Park Place, the road running on one side of the park, was also filled with the presence of the McDonalds Fiesta Tour which had rebranded and looked amazing! McDonalds, our Title Sponsor, was also handing out slushie samples and I heard they ran out! That’s a lot of people drinking slushies!!! The weather was gorgeous all day long and I once again loved going from booth to booth to photograph friends – old and new – and thank them for being a part of Fiesta’s Quince! This year I had Vanessa with me for most of the visits and loved having that experience with her. I also really can’t remember a time when we had as much pre-publicity for our event! Vanessa and I were booked on every station and one radio station leading up to the event. At one point during the festival, Vanessa and I had “dueling TV interviews” going on in the VIP section! Vane was talking to CBS and I was talking to NBC. We always had a great time with Claire Per-Lee of Style Advertising (Fiesta’s Advertising Agency) at each interview and she always photographed and videoed so we could have that memory. She made each appearance so easy for us complete with talking points and props needed for the interview. Claire, Vanessa and I were in such constant contact in the weeks leading up to Fiesta that it’s a little weird not getting several text messages a day from each other now! Morning segment with Jeh Jeh Pruitt of WBRC Fox 6! Photo opp with Jeh Jeh! He wore the taco costume!!! Everywhere I looked at this year, sponsors and nonprofits were doing a great job of reaching patrons and drawing them in. Swag from these booths was over the top! There was just SO much activity all over the park that it was hard to catch it all. That’s when I know we’ve hit a home run! We always throw sponsor items from the stage, but this year we really ramped it up and the crowd loved it! We’ve done this before but not to this level. Throwing swag from the stage! Volunteers…I can’t say enough about volunteers in general. They can make or break your event. It you’ve been involved with events, you know this. For Fiesta though, we’ve always been fortunate to have wonderful volunteers who have the spirit of the event at heart. This year I wasn’t able to secure a volunteer coordinator for this festival so I took on the task myself. And I was a little worried, I have to admit…especially with all the other responsibilities I had leading into Fiesta. That is…until I got a message from a Spanish teacher Charity Jackson at Parker High School. She said she had about 15-20 students who wanted to volunteer! I was ecstatic!!! And then she contacted me and said she had more students who wanted to volunteer! By the time I had the volunteer schedule pulled together two days before the event, she had 35 students committed to working at Fiesta! Ms. Jackson kept thanking me for having them at Fiesta but I told her several time that she really saved “me” by having her students there. They were incredible…and so was she! Spanish Teacher Charity Jackson with her students from Park High School – these kids were the best volunteers! There are so many more stories about Fiesta 2017 that I could tell…but as I have done in the past, I think it’s best shown in photos. If you came out to Fiesta, thank you…from the bottom of my heart for sharing our Quince with us! If you weren’t able to be there…for whatever reason, I hope you enjoy a walk through our Quince in these photos! 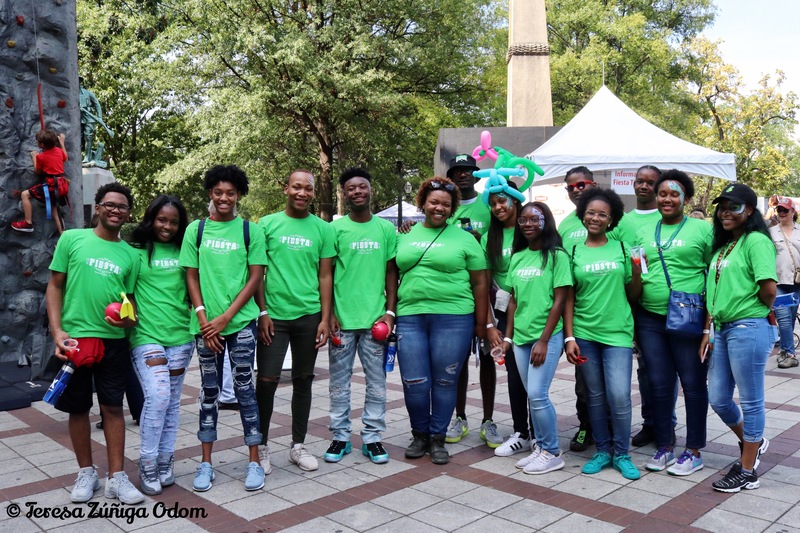 This entry was posted in Birmingham, Festival, Fiesta, Hispanic, Linn Park, McDonalds, Quinceanera and tagged Canon Photography, Charity Jackson, Claire Per-Lee, Denise Koch, Denise Koch Events, Lui Fernandez, McDonald's Fiesta Tour, Parker High School, Photography, Style Advertising, Vanessa Vargas, Volunteers on October 20, 2017 by Southern Señora. Cynthia Rowley placements I found at TJ Maxx this year! Collecting Day of the Dead/Dia de los Muertos items has become a year-round thing for me. It used to be that I would begin seeing things in stores around September but these days, you can find things all the time! Granted, a lot of the items I find in local stores like Target are rather whimsical and mass-produced. They still blend nicely with my more unique pieces and give me ideas for creating my annual Day of the Dead altar at home. 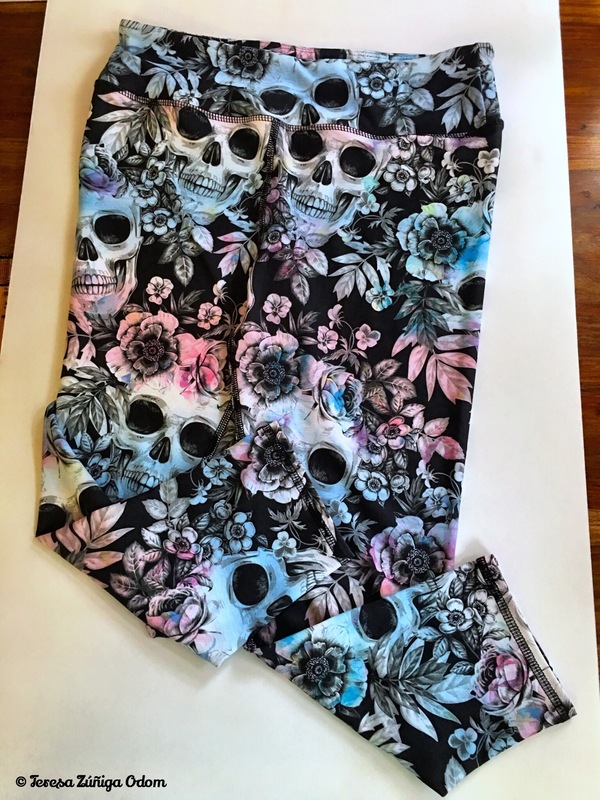 DOD Sugar Skull yoga pants! Aren’t these cool?! In August, I was in TJ Maxx with my daughter when I spotted these cute pumpkin DOD placemats by Cynthia Rowley! There was also a tablecloth, but I decided to just get the placemats. Of course, when you are at TJ Maxx, you have to look through the clothes section and I was thrilled to find these sugar skull yoga pants! I’m sure I’m going to turn a few heads when I wear them at my local YMCA later this month! Ready to pour up some coffee in this cool sugar skull porcelain cup from World Market! I always go to World Market to see what their new collection looks like. I happened to hit it right when they were putting all their items out on display last month. I was drawn to this sugar skull bowl because of the subtle colors. Plus they had a pillow with the same sugar skulls and colors on it! I had a $40 gift card which helped me pay for these two items. Oh, and I also found this incredibly colorful porcelain cup because…why not?! Cute little sugar skull man and woman figures from Target this year! This sugar skull candelabra reminds me of vintage sugar skull creations. This one is from Target. Dollar Spot bargain sugar skull buckets! On to Target…you know they always have a DOD collection and it seems to have gotten bigger over the years! This year, I added a sugar skull banner, a trio of Day of the Dead birds, two sugar skull “dolls” and a sugar skull candle holder! They also have some cutesy items in their Dollar Spot section and I decided to buy two of the fabric sugar skull buckets. I figured they would be good to use for candy for Halloween. It’s interesting how both World Market and Target seem to have coordinated their color scheme this year for their collections. I’m loving the blues, oranges and pinks in these new items and they’ve made for a very coordinate kitchen table this year! 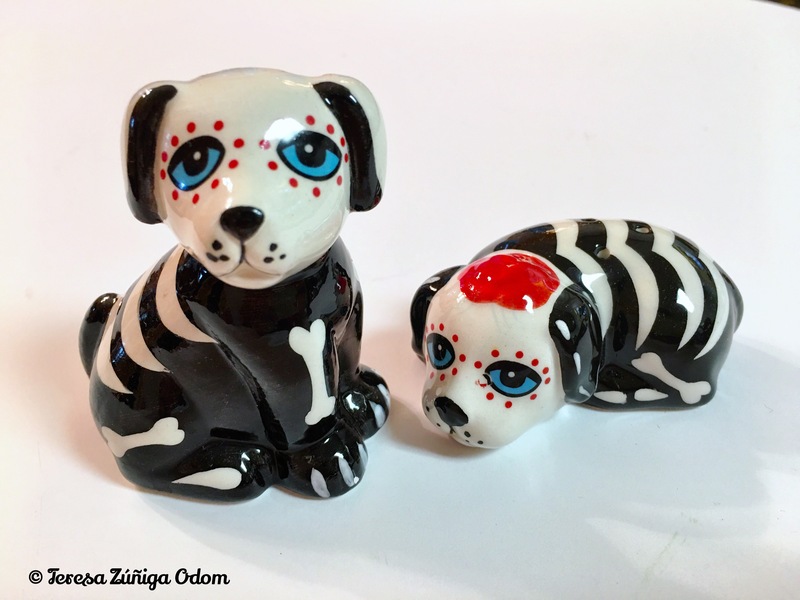 These little sugar skull pup salt and pepper shakers remind me of my pup, Lucy! These are from Von Maur. Von Maur Department Store had these cute sugar skull dog salt and pepper shakers! They reminded me of my pup, Lucy so of course I had to buy them! This was an unexpected place to find DOD items! 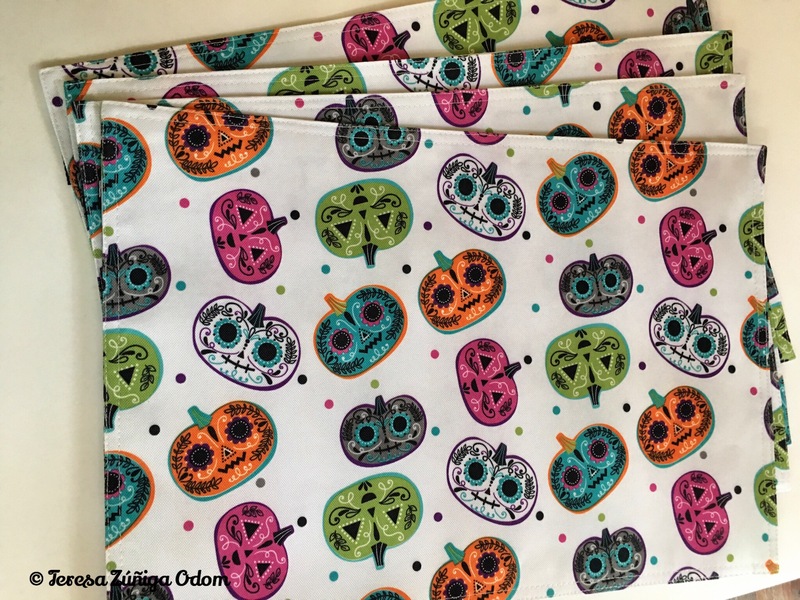 Vintage style designs on these Day of the Dead placemats I found at the Albuquerque airport! This year, we had my Zuniga family reunion in Albuquerque, New Mexico and I always look forward to finding new DOD items when I’m in NM or out west. Amazingly, I always find the best items at the Albuquerque airport! 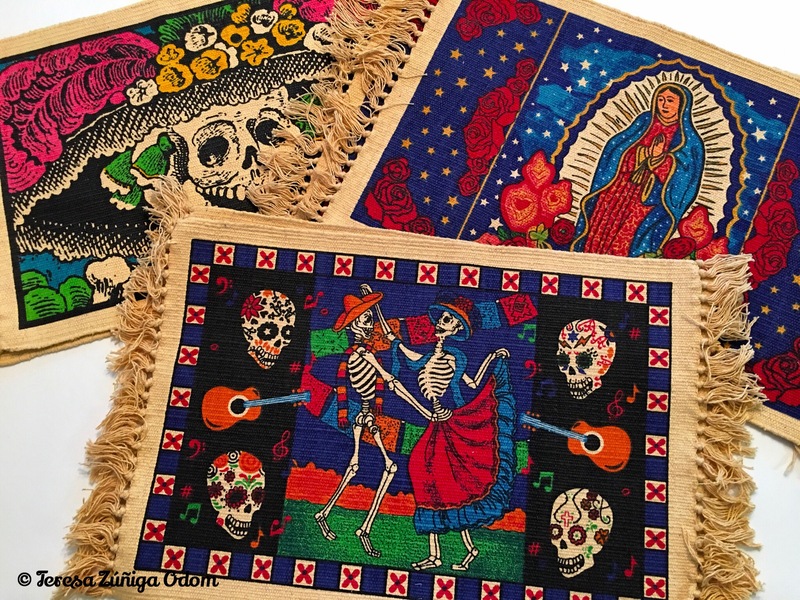 These placemats are beautiful with their traditional depictions including La Catrina, La Virgen de Guadalupe and dancing sugar skulls. I bought 6 total – two of each and plan to use them on my dining room table when I create my altars this year. The sugar skull mug my cousin made for me! 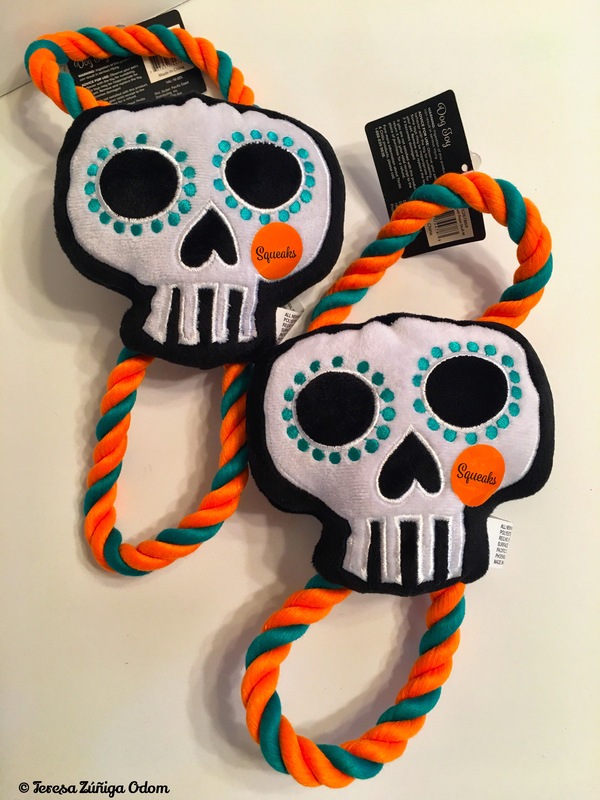 Sugar skull puppy toys – one for Lucy and one for my grandpup, Lucia! These are from Pet Smart. Finally…I was in Pet Smart to pick up some doggie treats for my pup, Lucy when I spotted these DOD puppy toys! I picked up one for Lucy and one for my grandpup, Lucia! They squeak which should make for an interesting game of fetch and retrieve! I’m sure there will be more to add as we get closer to Day of the Dead. I really can’t help myself when I see these items…I think I’m going to have to add another storage container or two this year to accommodate everything! This entry was posted in Day of the Dead, Dia de los Muertos and tagged Albuquerque, Cynthia Rowley, La Catrina, Pet Smart, Sugar Skulls, Target, TJ Maxx, Von Maur, World Market, Zuniga Family on October 16, 2017 by Southern Señora.